Candidate students, who are hoping to study journalism at the prestigious Sofia University, had to write an essay about Bulgaria's potholed streets and the symbolism of it at a preliminary exam that took place on Sunday. The unusual topic was picked days after disgruntled drivers launched rallies across the country in protest against its potholed streets. 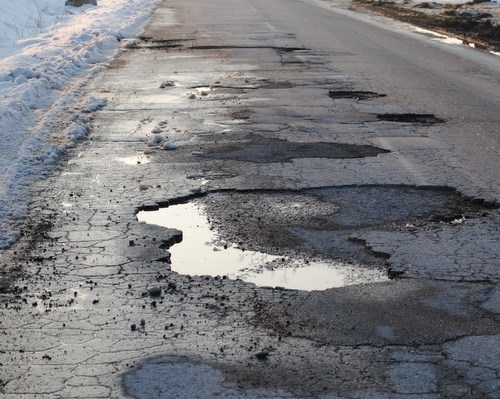 Unlike the mass protests in the central town of Veliko Tarnovo and the Black Sea City of Varna, hardly twenty people gathered last week in front of the building of the parliament in the capital Sofia, shouting "No to the potholes!". The protesters said low-quality and partial road repairs were just a way to syphon off money as they did not seem to do a lasting job. In a declaration, which they submitted to the Sofia municipality, the protesters demanded that the civil society wields more power in monitoring the road repair works and called on the municipality to present a year-long plan. The protests are organized by the administrators of independent website www.dupka.net, on which drivers share their bad experiences on the roads.